The ElderShield insurance scheme, which offers protection against severe disability, is getting a makeover. The committee reviewing it has suggested making it compulsory for all and lowering the age at which people join the scheme. Financial experts welcomed the changes that are under way, especially the proposal to cover those with severe, pre-existing disability. "With medical technology advancement, we are expected to live longer. However, we are not sure how many will be healthy years. We may need assistance as we age and that will require financial resources," said Mr Alfred Chia, chief executive of SingCapital. Mr Daniel Lum, director of product and marketing at Aviva Singapore, said if someone is left wheelchair-bound after an accident or illness, the monthly payouts from ElderShield would pay for long-term costs such as daily care, special aids and home modifications. "This relieves the need to rely on one's family for financial support, which - in the light of Singapore's low replacement levels - may be increasingly hard to achieve." However, ElderShield is just meant to be a basic coverage. This explains why Mr Chia, 50, has opted to purchase a supplementary plan - on top of his basic ElderShield 300 plan - to obtain higher payouts that will continue for as long as he lives. When he was 40, he bought the Aviva MyCare plan - with an annual premium of $736.60, of which $600 is payable through Medisave - which comes with lifetime cover. In the event of a claim, he will receive monthly payouts of $2,000 for life. The premiums are payable annually and will cease if a claim occurs. Similarly, Mr Christopher Tan, 47, chief executive of Providend, also owns an Aviva MyCare plan. He said he did not opt out of ElderShield as he wanted to maximise the use of his Medisave when it came to his severe disability coverage. Central Provident Fund (CPF) members can pay the annual premiums of their basic ElderShield plan from their Medisave account. They are also allowed to withdraw up to $600 annually from their Medisave for ElderShield supplements. Most financial experts agreed that ElderShield should be made compulsory for all future cohorts with no opt-out allowed, so as to increase the risk pool and widen the safety net. The 14-member committee also proposed that the Government take over as administrator from the three private ElderShield insurers. This will give the scheme economies of scale and allow it to be operated on a non-profit basis. 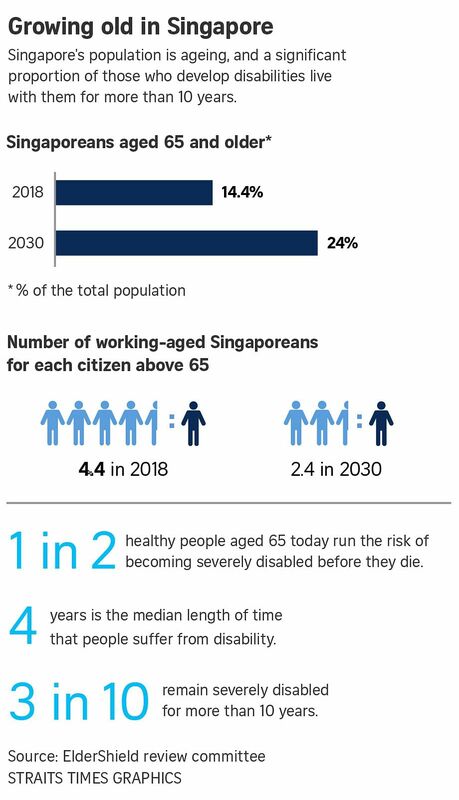 According to estimates from the Ministry of Health (MOH), half of Singaporeans who are healthy at the age of 65 are at risk of developing a long-term disability over their lifetimes. The review committee will also look at the size of payouts and their duration, which means premiums could increase. That's why making the scheme compulsory makes sense - otherwise people could be tempted to opt out and premiums could become unaffordable. The Sunday Times highlights what you should know about ElderShield. Launched in 2002, the severe disability insurance scheme was designed to provide basic financial protection to Singaporeans who need long-term care. In the event of a successful claim, ElderShield policyholders will receive monthly cash payouts for a period, depending on the plan. Those with supplementary plans will have enhanced cover. All Singapore citizens and permanent residents with Medisave accounts are automatically enrolled in ElderShield at the age of 40, unless they opt out. The three private insurers appointed by MOH to run ElderShield are Aviva, Great Eastern (GE) and NTUC Income. Existing illnesses, such as diabetes, are not excluded for those who are auto-covered at the age of 40. However, if you opt out and wish to opt in later, you will be subject to a medical assessment, during which your application may be rejected by the insurer if you have pre-existing illnesses. Severe disability is the inability of an individual to independently perform at least three of the six activities of daily living (ADLs), with or without mobility aids such as walking aids and wheelchairs. The activities are washing, dressing, feeding oneself, using the toilet, moving around indoors, and being able to get between a bed and a chair. Do note that if you are severely disabled prior to your ElderShield enrolment, you cannot make any claims. Make a declaration when you receive your "welcome letter" and any premiums collected from you will be refunded. WHAT ARE THE TYPES OF ELDERSHIELD PLANS? There are two basic ElderShield plans. ElderShield 300 was the default plan for people who joined the scheme between September 2002 and August 2007, with a monthly cash payout of $300 for up to five years. For ElderShield 400, which was the default plan after September 2007, the monthly cash payout is $400 for up to six years. For both basic plans, the premium payments cease after age 65, but you can continue to make a claim for severe disability at any age afterwards. While the basic ElderShield coverage is the same across the board, each insurer's ElderShield supplementary plans offer differentiated and unique benefits, including higher monthly payouts and for longer durations. For instance, Aviva's ElderShield supplements (MyCare and MyCare Plus) are designed to offer both higher benefits (up to $5,000 monthly payout benefit) as well as a longer payout period (for a lifetime). For Aviva MyCarePlus and GE ElderShield Comprehensive, claims are triggered when the policyholder is unable to perform two out of six daily activities. Income's PrimeShield offers a lump sum payout in the event of severe disability equal to three times the monthly payout and a get-well benefit that is also a one-time payout if you recover from severe disability, said Mr Andrew Yeo, Income's general manager for life and health insurance. WHAT ENHANCEMENTS WOULD FINANCIAL EXPERTS LIKE TO SEE? Mr Chia hopes the basic ElderShield scheme can lower its claims threshold to two out of six daily activities and a reduced premium for enhanced coverage as well, with a wider pool of lives insured. Mr Brandon Lam, Singapore head of the financial planning group at DBS Bank, wants more flexibility to be given to ElderShield policyholders to choose higher payouts, if they want more comprehensive cover; to increase the payout duration (from up to six years) and to raise the CPF annual withdrawal limits for ElderShield. GE's managing director of group marketing, Mr Colin Chan, said any future increase in premiums should be kept affordable for all. Mr Chia said it is a trade-off between the quality of care you want and what you pay. It makes sense to purchase such coverage when you are younger as you can then lock in the lower premium till the age of 65. Aviva's Mr Lum suggested that customers look for a plan that covers the aspects they might be concerned about. For example, some customers with children may desire a dependant benefit (which provides a one-time payout if you have children below aged 21), while others may be concerned about the payout amount and period. Ms Catherine Lum, Providend's insurance specialist, said it is prudent to ask yourself what would be your choice of caregiving, how much you require for the monthly benefit, and how long you are prepared to pay premiums. Mr Chan said: "As ElderShield currently covers three ADLs, customers may wish to consider ElderShield supplement plans that allow claims to be triggered at an earlier onset of disability (such as the inability to perform two ADLs). More comprehensive coverage has to be balanced against premium affordability." Instead of looking at each need separately, Mr Lam said he would advise the customer to do a holistic financial review of his circumstances and what he would like to achieve in his retirement years. This would let him plan his resources to reach his financial goals. Download the claim form from your private insurer's website and get an accredited doctor to assess your disability. The disability assessment can be done either by visiting the appointed assessor (a fee of $50), or at home via a house call ($150). If your ElderShield claim is approved, your insurer will reimburse the full cost of the assessment fee to you. You will receive the first payout within 90 days of approval. AM I COVERED UNDER ELDERSHIELD? To find out, log on to the CPF Board website with your SingPass. Select "My Messages" and check under the "Healthcare" section. If you are covered under ElderShield, this section will also let you know the insurer you are covered under. IS ELDERSHIELD A PROFITABLE SCHEME? So far, ElderShield has been profitable for the three insurers. In Parliament last year, Health Minister Gan Kim Yong said $2.6 billion in ElderShield premiums was collected between 2002 and end-2015, and around $100 million was paid out in claims. While premiums collected may be far in excess of payouts thus far, the gap has been shrinking and will continue to close, he said. Mr Lum said MOH made a specific provision in the ElderShield contract for insurers to return part of the accumulated surplus to existing policyholders, if claims turn out to be lower than projected. He added that Aviva provided a premium rebate in September last year for eligible customers. Recently, Income also gave a rebate to eligible ElderShield customers. "The ElderShield scheme is still in its early days and long-term claims data and experience have yet to be developed. It is essential to bear in mind that there are real risks of claims rising in the future," said Mr Lum.